What a crowd at the Miami National Antiques Show – and that’s not a compliment! 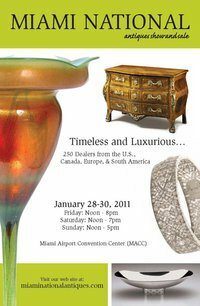 The Miami National Antiques Show took place this past weekend, January 28-30, 2011. The show looked great with many fine dealers displaying important items. Show attendance was up from last year, but that’s a bit misleading as attendance was quite low last year. But these are steps in the right direction – more exhibitors, better exhibitors, and increased attendance. The promoter, Rosemary Krieger, did her job. The problem is you can bring a horse to water — well, you know the rest. I can’t figure out what’s happened to the buyers at this show. They used to be fairly sophisticated and well-to-do, but that seems to have changed. Now I get questions like “Are those Carnival Glass?”, pointing to my collection of Tiffany Favrile glass. I exhibited some of the finest items I’ve ever owned, with hardly a reaction. At least, there should have been lots of oohs and ahs, even if they didn’t result in sales, but there were very few. My show was poor. In speaking to several other dealers, their results were tepid. I did hear second-hand that jewelry dealers were doing better. It wasn’t a total disaster for me as I bought well. That’s half the battle. Ultimately I’ll sell those items, so that counts towards the results for my show. I’ll exhibit at the show again, but with lowered expectations. This coming week is the big, much anticipated Original Miami Beach Antiques Show. It begins on Thursday, February 3, and lasts for five days. I suspect the results will be significantly better. If you haven’t ever visited this show, make your plans immediately. It’s a huge show, with fantastic merchandise. Buyers fly in from all over the world, so you’ll be in good company. 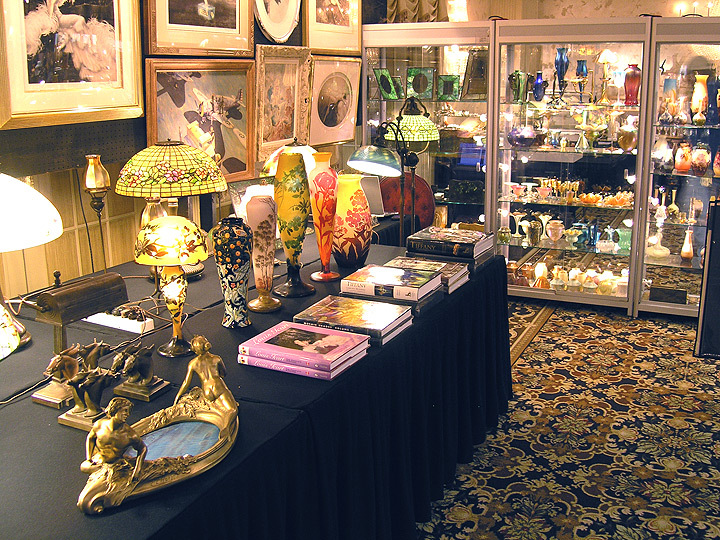 The Miami National Antiques Show will open to the public tomorrow, January 28, 2011. Lots of changes for the good are happening, so hopefully the show will enter a virtuous circle and get back to its former glory. Credit needs to go to Rosemary Krieger, the show’s promoter. The first changes are to the building itself, done by Turner Construction. Most the changes are cosmetic, but quite nice — new lobby, new bathrooms, new lighting, etc. The exhibition looks better because of the changes. Secondly, and more importantly, is the quality of the show. This is no local 25-dealer show with McDonald’s glass collectibles. 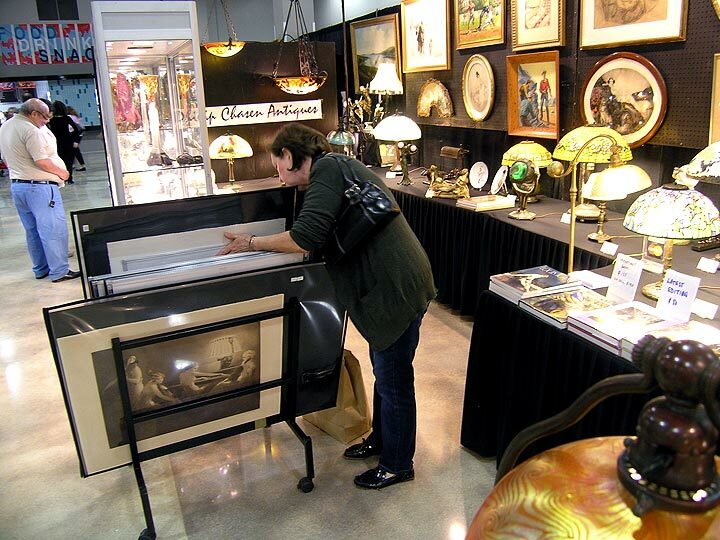 It’s a 100+ dealer show with top-notch exhibitors who exhibit at important shows. The quality throughout is very high. Additionally, the show is growing again. The first floor is full and the second floor was supposed to have 20 dealers. They couldn’t exhibit, as the construction to the second floor isn’t complete. Hopefully the show will have a second floor next year. My advice? Visit this show and get first crack at many of the fine items that will be exhibited at next week’s huge Original Miami Beach Antiques Show at the Miami Beach Convention Center, February 3-7, 2011. I guarantee you’ll be pleased with what you see. Personally, I’ve just added over 15 great Daum and Gallé vases that are not listed on my website, including Daum rain miniatures, a Daum mushroom vase with two handles, a Daum vase with wheat, a second Daum rain vase, etc. You’ll just have to visit me at the show to see these beauties. This story doesn’t end the way I planned it, but I trust you’ll find it interesting. Leslie Hindman Auctioneers, of Chicago, held their Marketplace auction on January 19-20, 2011. 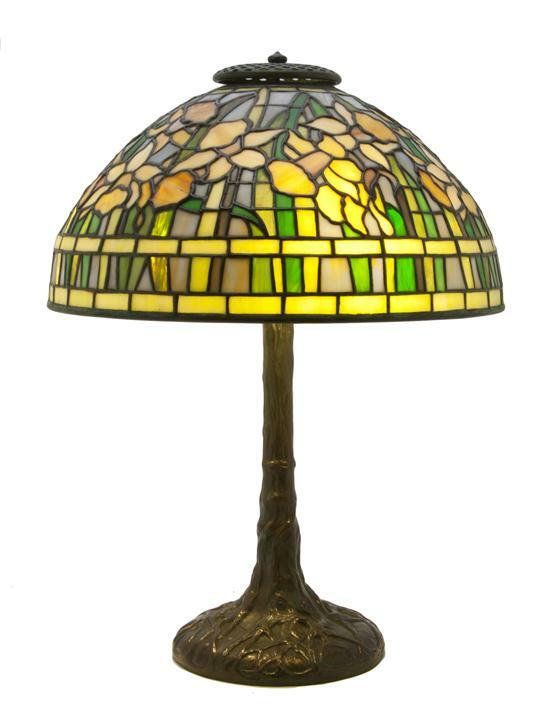 Included in their offerings was lot 346, described as An American Leaded Glass Daffodil Table Lamp, after Tiffany Studios, raised on a tree trunk standard. 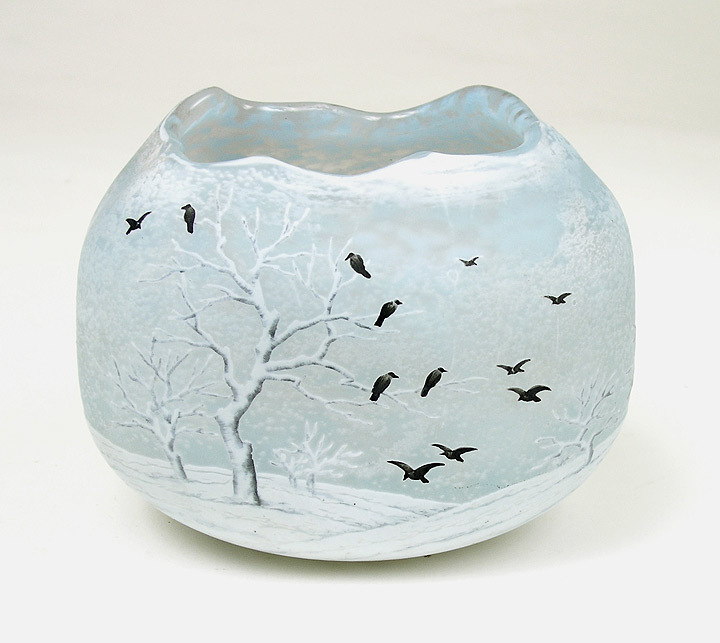 Height overall 18 1/2 inches, outer diameter of shade 13 7/8 inches. Estimate $800-1,200 , and that’s where my story begins. I called the auction house and spoke to the expert in charge and asked Hindman to ship the lamp to me for inspection. I volunteered to pay for the shipping in both directions. Unfortunately, they were unable to comply with my request as this wasn’t their property, but the property of the consignor (in this case an estate). 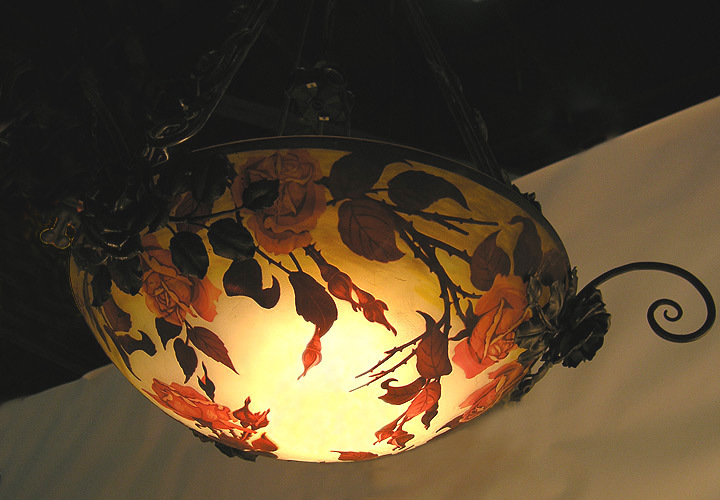 They sent many detailed photos, which only confirmed my suspicion that the lamp was authentic. The problem was that photos were insufficient to make a 100% decision about its authenticity — I had to see it in person. Unfortunately, the only way I could do that was to fly to Chicago. So, on the Saturday before the auction, I flew to Chicago. The expert in charge, Mike Intahar, kindly agreed to meet me at the auction house to view the lamp. In person, there was no question — the lamp was authentic. I turned right around and flew back to New York. In and out in a few hours. Now armed with knowledge, I could bid with confidence. The lamp had a retail price of $25,000 – 30,000, but I wanted to be conservative, so I could resell it quickly for $20,000 or less. The auction took place on Wednesday, January 19th. The problem was that I didn’t record it in my calendar, so I completely forgot about it. I was in the city with my wife, when I checked my phone. There were two messages from Hindman’s that I had missed their calls. My heart sank! 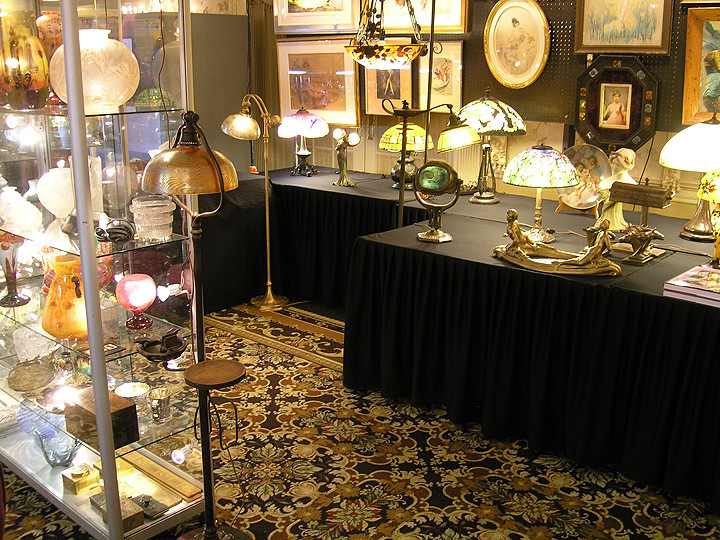 Here I had spent the time and money to go to Chicago to inspect a lamp, only to forget about the auction!!! Argh! I called Hindman’s and much to my relief, I hadn’t missed the lamp. It was an unimportant lot, earlier in the sale, that I had missed. Whew!!! Dodged a bullet on that one. Now I was prepared to bid. They were going to call me back within the hour. At around 2 PM EST, Hindman called me to bid on the lamp. The bidding started at $400, which was a very good sign. It meant that no one had left a bid. I let other bidders start the bidding before I jumped in. $1000, $1500, $2000, still good. I was prepared to bid $10,000, or more, so there was plenty of room. $8,000, $9,000, $10,000 — oops, not looking too good any more. $16,000, $17,000, ($20,740, including buyer’s premium), and the bidding ended. Oh well! Nothing ventured, nothing gained. I exchanged one day’s time and $500 in expenses for the possibility of a big payday. But it wasn’t meant to be. Two other bidders, one on the phone and one in the room, were also knowledgeable. I have no regrets. If I have the opportunity again, I will do exactly the same thing. Throw enough #*&% against the wall and something will stick. Tastes in French cameo glass have changed considerably over the last 35 years as the buyers have changed. At first, American buyers were more interested in Gallé than other makers. In retrospect, it appears that it was just naivete. They didn’t yet know much about other makers. When the Japanese started buying heavily in the late 1980s, their tastes changed the market. They were willing to pay a premium for sophistication – techniques beyond the basic of acid-etching, like wheel-carving, or applications. The market changed once again in 1990, when the Japanese dropped out suddenly, as their real estate bubble burst. American taste moved to the forefront again. But now, there was more knowledge available from multiple resources, including new books, more dealers and of course, the Internet. So what is modern American taste? The keyword now is pretty. Americans appreciate pretty more than sophisticated. That fundamental shift has caused the value of many Daum Nancy acid-etched and enameled items to go up in value while wheel-carved and applied items have either stagnated or gone down in value. As a result, the balance of interest has shifted 55/45 to Daum. The same characteristics apply to Gallé. The item has to be pretty, which usually means a nice shape, together with brighter colors, like red, blue, purple, pink and yellow. Brown seems to be one of the worst colors. Gallé produced many vases in the green and brown family, which have moved down the totem pole and are difficult to sell. The change in American taste has created an interesting anomaly – vases that took much longer to produce from highly skilled workers are priced lower than simpler, but prettier vases. It’s similar to the stock market – there is currently an opportunity to buy a segment of the market that is out of favor. Will it come back into favor? Who knows? All is takes is a determined few to start collecting these items and the market will reverse. I recommend the purchase of these items for their beauty and importance. If they also happen to go up in value, that would be a nice bonus. I haven’t mentioned any of the other French cameo glass makers as there isn’t much interest from Americans. To be fair, there is a decent amount of interest in Muller, the number three maker of French cameo glass. Then in order, there are D’Argental, deVez, Legras, Richard, and a few others. I rarely offer their works for sale as there are so few collectors. The quality of some of these makers, like D’Argental, is quite good, but often the colors are not appealing. Most weeks I will now be posting a new blog on Mondays only. Occasionally I will add a second one, usually on Thursday. Unfortunately, I don’t have the time to post more often. I might try posting a video blog on youtube, but I just have to get over the inertia of doing the first one. 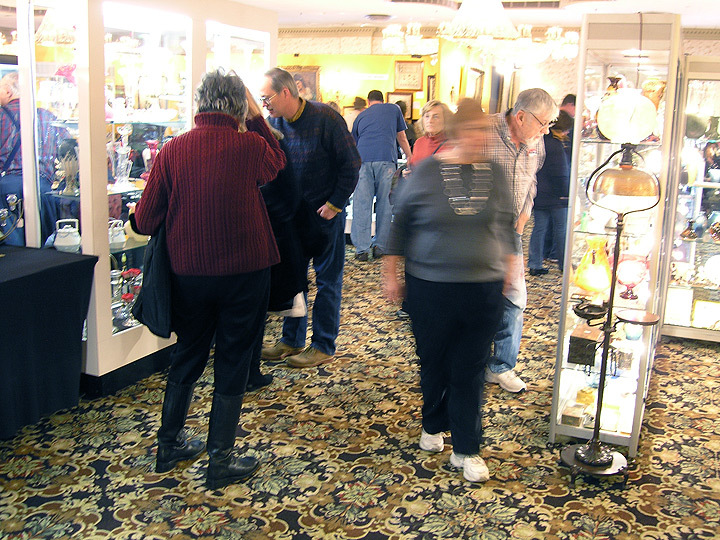 I used to exhibit at the Birchwood Manor Antiques Show regularly, but gave it up many years ago. I tried the show one more time a couple of years ago in the summer, with tepid results, so I crossed it off my list. 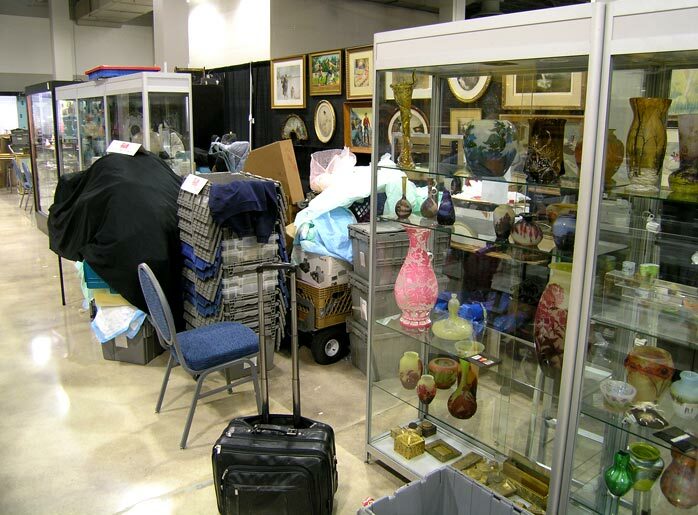 Then recently, I received a call from the show promoter, Allison Kohler of JMK Shows, who told me she had a good booth that became available because of the retirement of one of her exhibitors. The timing was right, so I decided to try the show one more time. Friday was a very slow day, mostly because of the threat of significant snow. Many people were afraid to get on the road. The storm tracked away from the area, so it really was a non-event. Regardless, there was no business whatsoever from the few people who attended. I assumed that the attendance (and hopefully sales) would improve on Saturday. Attendance definitely improved and so did business, ever so slightly. At this point in my thinking, I was never going to return to Birchwood Manor. On Sunday, attendance increased even more. By the end of the day, sales had increased to the point where I didn’t lose money at the show, but I didn’t make enough to want to return. I suggested to Allison that what this show needed was a change from a three-day show to a two-day show. Anyone who would normally visit on Friday would be obligated to attend on the weekend. Attendance would increase on the weekend, raising the level of activity and that elusive quality “electricity”. From the dealer’s point of view, it’s a “win-win”. Attendance and interest (and probably sales) will go up, with less time committed to exhibit. How can you beat that? Much to Allison’s credit, she was enthusiastic about my suggestion and after asking other exhibitors for their opinions, it now looks like next January’s show will be two days! With a smaller commitment of time, it’s likely that I will exhibit there one more time. Now it’s up to the clients of the show. If you would like me to exhibit there regularly, visit the show and buy something from me! Another “win-win” situation! 2010 was a very good year for better Tiffany Studios items, continuing a decades-long trend of new records nearly every year. The fireworks began at the Cottone sale of March 27th. 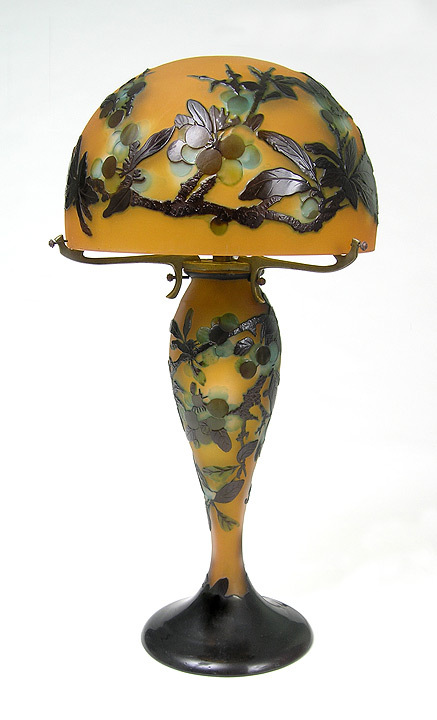 A Tiffany Magnolia floor lamp that descended in the family of Merton Armstrong, sold for $661,250. In the same sale, a very good 20″ Dragonfly, on a great lily pad base, sold for $172,500. 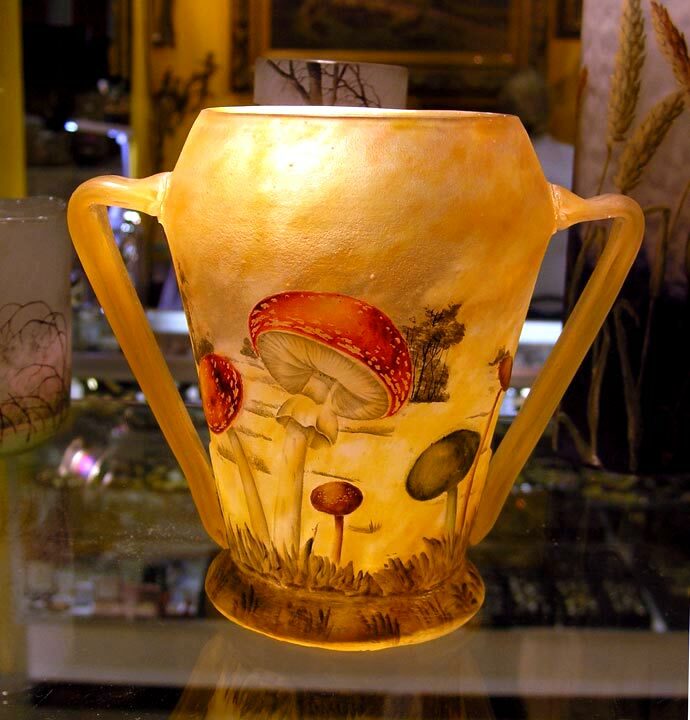 Tiffany glass and pottery came up for sale at the Rago sale of April 24th. A rare 6″ tall pottery artichoke-form vase, sold for $19,520, approximately double the high estimate. In the same sale, a 9″ Favrile vase with elaborate gold hearts & vines decoration on a deep carmel background sold for $26,840, approximately four times the pre-sale estimate. Those were just the warm-up acts for the 20th Century Decorative Arts sales in June. 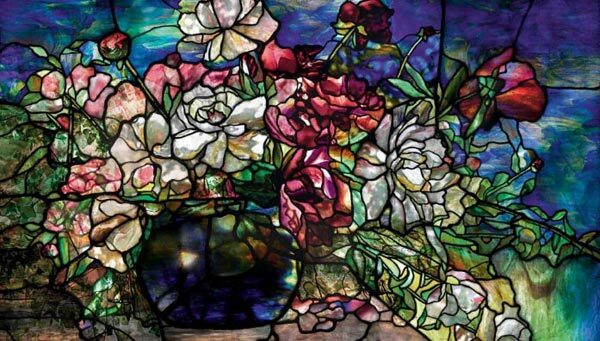 Sotheby’s was first, offering 22 important Tiffany Studios lots. 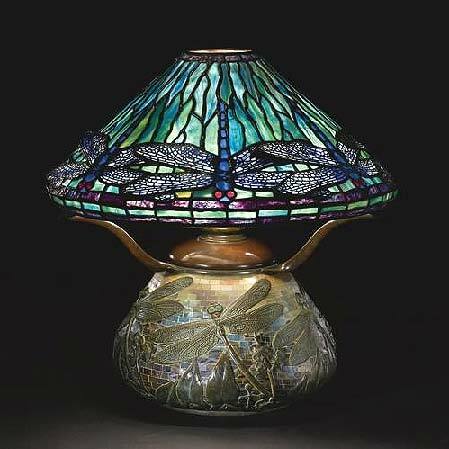 Three of the lamps sold just above or below the half-million dollar mark, including a gorgeous 17″ Dragonfly on a matching mosaic base, which sold for $554,500. Christie’s held their Decorative Arts sale the next day. 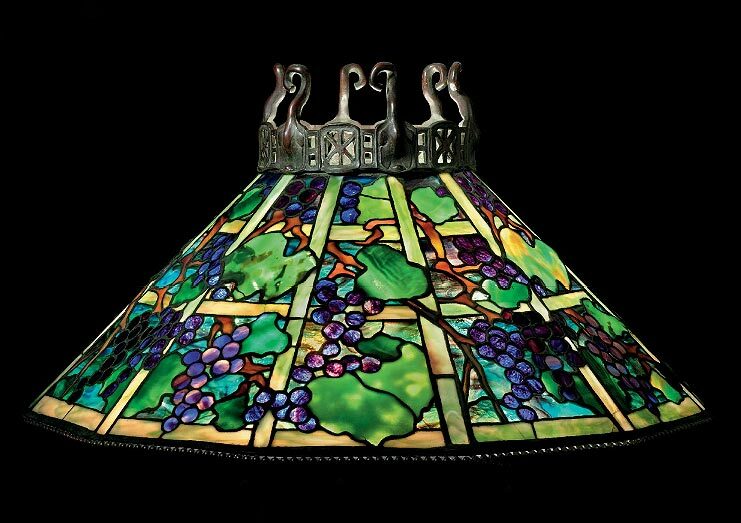 A beautiful Tiffany Studios Grape chandelier sold for $398,500, more than double the low estimate of $150,000-200,000. Christie’s results were not as good as Sotheby’s, but that wasn’t a total surprise as Sotheby’s offerings were better. Leland Little held a sale on September 18th with some important estate-fresh Tiffany Favrile glass. 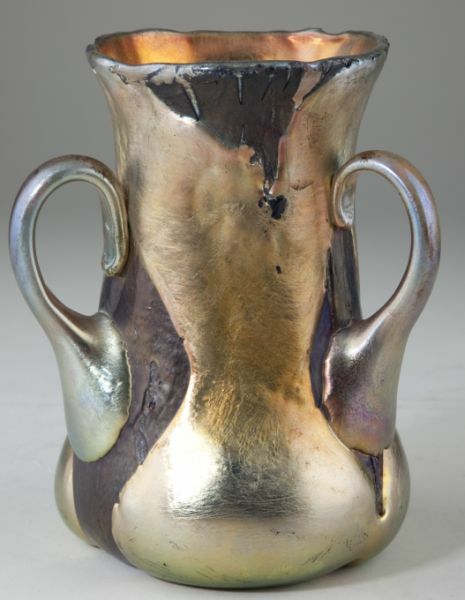 They didn’t know how good their glass was, so they underestimated a loving cup to sell for $1,000-2,000. It soared to $62,100, including buyer’s premium — a price commensurate with its quality and rarity. 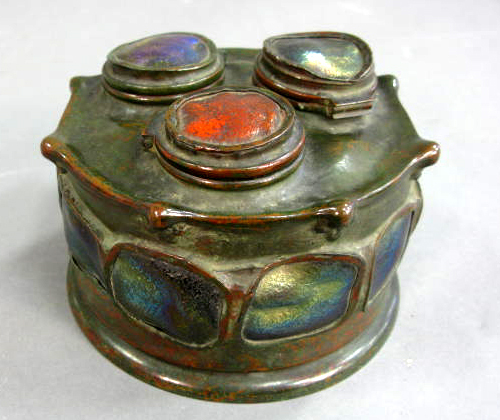 The string continued on October 30th when Nadeau’s sold a killer Tiffany Studios inkwell for $37,500, against a pre-sale estimate of $15,000-20,000. Like a good fireworks show, the year ended with the finale — both Sotheby’s and Christie’s sold Tiffany items for approximately $1 million. Sotheby’s was first with the sale of a magnificent Peony window for $962,500. 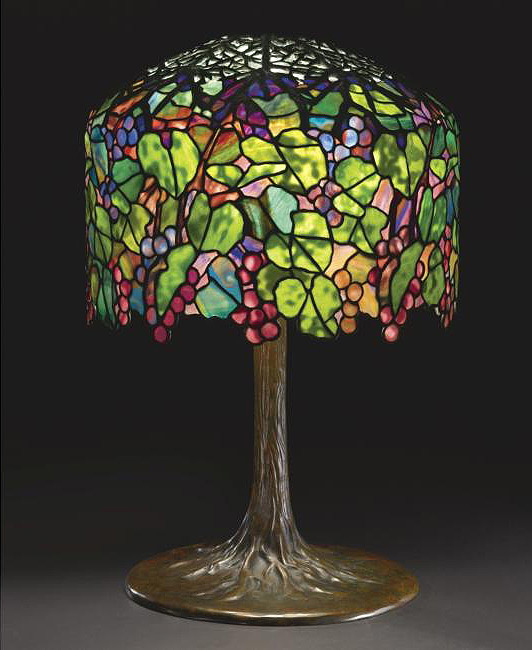 Christie’s followed the next day, with the sale of a Grape lamp for $1,202,500. These were only the headline results. Both sales were solid throughout with many very strong sales. I rarely give investment advice but I did when a wealthy client asked me about ten years ago. I told him that the better Tiffany Studios items had performed best over the previous twenty years and I had no reason to doubt that they wouldn’t continue. I never found out if he followed my advice, but I hope he did. He surely would have done significantly better than the last decade in the stock market. 2011 is looking up. The antiques business saw a significant recovery from 2009 levels and appears to be continually getting better. The Miami Beach Antiques Show at the end of January is always a good barometer for the rest of the year. I’m cautiously optimistic.